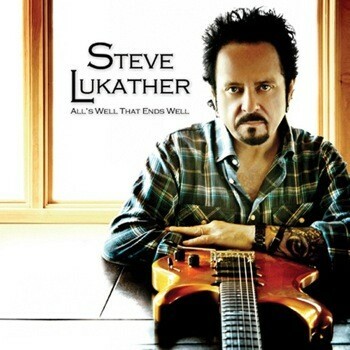 Guitar virtuoso Steve Lukather is a bit of an enigma when it comes to his solo albums. It can never be predicted what the Toto mainstay will deliver and his sixth album is no exception. I was especially fond of his 2008 release ‘Ever Changing Times’, which was a heady mixture of his rock, pop, jazz and fusion sides, and I suppose ‘All’s Well That Ends Well’ covers the same wide spectrum but with most of the album hovering around the middle ground between all these genres without going overboard on any of them. Steve first album for the Mascot label is sadly accompanied by a press sheet that tells you nothing about who plays on it or is involved in it other than The Tubes’ Fee Waybill helped with the backing vocals and songwriting and famous session keyboardist C.J. Vanston helped write some songs too. What is clear is that Luke has been through some other turmoil in his life besides Toto falling apart, with a big melancholy vibe running through the lyrics of ‘Darkness In My World’, ‘Can’t Look Back’ and ‘Don’t Say It’s Over’. Musically those are three of the strongest tracks, DIMY starting with an atmospheric intro and samples and turning into a Toto-like melodic rocker with laid–back jazzy parts punctuated by big guitar riffs, fretless bass runs and a typically smooth guitar solo. ‘Can’t Look Back’ is probably the rockiest track with a great solo and big chorus but is still built around a mellow verse, whilst ‘Don’t Say It’s Over’ is Lukather’s big ballad with another jazzy instrumental workout and superb emotional guitar solo. The mellow jazzy tracks abound with the westcoast vibe of ‘On My Way Home’, the groovy ‘Brodie’s’ and the bluesy ‘Flash In The Pan’, whilst the progressive fusion instrumental ‘Tumescent’ and melodic rocker ‘Watching The World’ are other highlights, the latter featuring some of Lukather’s best vocals and soulful guitar playing. On the whole this is one of Steve Lukather’s more introspective records and at nine tracks a little on the short side too. I would say that it’s closest to his ‘Luke’ album in style and if you’re already a fan of the man you’ll love it. Without putting his creative energy into Toto it’ll be interesting to see how his solo career develops from here.